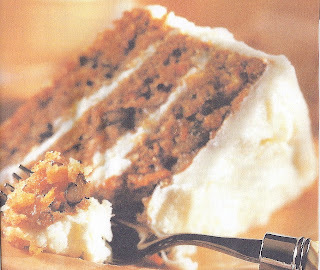 This carrot cake is my all time favorite cake. The recipe comes from Southern Living. I have made it many times over the years and it always turns out amazing! Very moist and the leftovers (if there are any) will keep in the fridge to enjoy for days!! Grease Three 9 inch round cake pans; line with wax paper or parchment paper. Lightly grease wax paper and then flour pan. Set pans aside. Bake at 350° for 25 to 30 minutes or until a wooden pick inserted in center comes out clean. Drizzle Buttermilk Glaze evenly over layers; cool in pans on wire racks 15 minutes. Remove from pans, inverting; peel off wax paper; invert again (glaze side up). Cool completely on wire racks. Spread Cream Cheese Frosting between layers and on top and sides of cake. Bring first 5 ingredients to a boil in a medium size sauce pan oven over medium-high heat. Boil, stirring constantly until glaze is golden, about 4 minutes. Remove from heat, and stir in vanilla.